Bri Lilly winds up for a serve during a match last season. Lilly was named to the preseason All-Big East team earlier this month. Collegian file photo/Jimmy Lafakis. 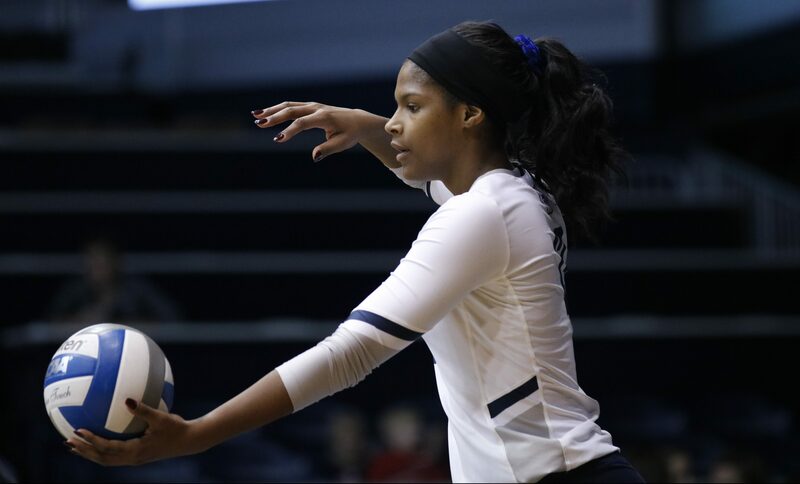 After making the Big East Tournament last year for the first time since 2013, the Butler University volleyball team isn’t ready to rest on its laurels. They want more than an appearance. They want a championship. Earlier this month, senior middle blocker Bri Lilly earned a spot on the preseason All-Big East team. Lilly and libero Taylor Takeda are the lone seniors who will play this year, as outside hitter Anna Logan will redshirt this season due to a back injury. Butler was picked third behind Marquette University and Creighton University, respectively, in the Big East Preseason Coaches poll after posting a 23-8 record last season. The Bulldogs are 0-3 on the young season after dropping three matches at the University of Pittsburgh this past weekend against No. 20 University of Pittsburgh, Pepperdine University and No. 24 California Polytechnic State University. A challenging early season docket also includes Auburn University, the University of Arkansas, Northwestern University and Santa Clara University. Butler sports nine returners from last fall’s roster, as well as eight new players. Five of those fresh faces are freshmen while three transfers round out the newcomers. Redshirt freshman Melody Davidson and redshirt freshman setter Maria Schorr have already seen action as Bulldogs. Davidson, a middle blocker, posted seven blocks against Pepperdine. Freshmen defensive specialists/liberos Jillian Ziemba and Elizabeth LaBue also played in Pittsburgh, with LaBue recording 11 digs on the weekend. Defensive specialist Jaleigh Rogan and outside hitter Brittany Robinson comprise the rest of the freshmen. Junior setter Megan Ramseyer, redshirt junior defensive specialist/libero Emma Milstead and sophomore outside hitter Shay Horn join Butler as transfers. Milstead posted 10 digs against Cal Poly, while Ramseyer added 25 assists in that match. A few weeks ago, the team sat and wrote their goals down for the season. That was when they decided to go after a Big East championship. The players wrote down their personal goals, their conference goals and their statistical goals. They gathered together with the coaching staff and spoke about their aspirations. The Bulldogs used summer open gyms to get to know each other and create chemistry on the court. They worked together to build a foundation for their campaign. Clark said the team’s main focus this season will be sustaining the team’s energy. The Bulldogs will play their first matches at Hinkle Fieldhouse on Aug. 31 and Sept. 1. Butler will host Auburn University, Eastern Illinois University and Illinois State University in the Top Dawg Challenge.